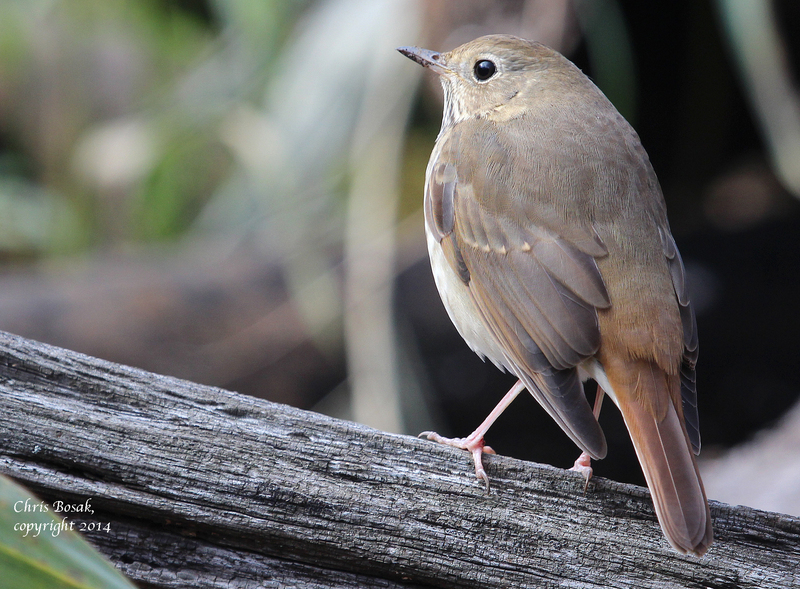 A Hermit Thrush rests on a log at Selleck’s/Dunlap Woods this fall. Here is the latest For the Birds column, which runs in several New England newspapers. With so many other temptations, sometimes it’s easy to forget about the most fundamental outdoor escape — a simple walk in the woods. The Atlantic coast beckons with promises of egrets, shorebirds, terns and perhaps — if you’re lucky — an oystercatcher or black skimmer. Local freshwater bodies of water woo nature watchers with wood ducks, red-winged blackbirds, herons and maybe a bittern. Fields attract butterflies by the score, as well as bobolinks, meadowlarks, and a rainbow of wildflowers. It’s hard for nature-watchers to resist sometimes. Of course there’s always the backyard, too. There’s no need to get in the car or invest any amount of time. Look out the kitchen window or sit on the patio and enjoy cardinals, blue jays, catbirds, chickadees and other backyard favorites. And there is the woods — waiting patiently for us to return. I returned a few days ago and was reminded over and over why outdoors enthusiasts have a natural instinct that draws them back. I left the parking lot and began walking. I had no route planned, no idea where I would end up. When I came to a fork in the trail, I took the one that seemed to lead deeper into the woods. The first bird I saw once I lost myself among the trees was an ovenbird, a small, ground-dwelling warbler noted for its “teacher-teacher” song. As far as warblers go, ovenbirds are rather nondescript. Named for the shape of their nests, they look like a small thrush with orange on its crown. Ovenbirds are fairly common and easy to find during spring migration, but occasionally you’ll run into one in the summer. Then the common birds of the woods began coming. I heard the “yank yank” of a nuthatch in the distance and soon spotted a different nuthatch near the trail. Chickadees were in abundance, keeping me company as I meandered about the woods. I stopped to watch a robin that was puffing out its orange breast from an obvious perch, but my attention was soon diverted by a flurry of woodpecker activity. First, I heard and soon found a red-bellied woodpecker. As I followed its flight from one tree to the next, my eyes crossed paths with a downy woodpecker. As I studied the downy, a hairy woodpecker flew in and landed on an adjacent tree. I was looking at three species of woodpeckers in one field of view. All I needed was a pileated woodpecker to join the party. That didn’t happen on this day. I kept an eye out for the larger creatures of the woods such as deer, wild turkey and hawks, but did not have any luck. I did hear a scratching noise toward the end of my walk that I recognized immediately. I looked down and, with very little effort, found an eastern towhee shuffling around the ground litter looking for insects. As my haphazard route finally led me back toward the parking lot, I thought about what a great walk it had been. I had seen a lot of different types of birds and felt as if I had nearly satiated my natural instinct, once again, to enjoy the woods. Something was missing, though. I didn’t know what it was until I heard it: The song of the wood thrush. To me, nothing says the woods quite like the wood thrush, especially its flute-like song. It completed my outing. I had satisfied that recurring urge to lose myself in nature’s most basic habitat. The woods will draw me back — they always do. This entry was posted in For the Birds column and tagged bird column, call of the woods, chris bosak's for the birds by Chris Bosak. Bookmark the permalink.